Fall is here and with it has come another arm-full of awards for Buffalo Trace Distillery, this time from the 2014 New York World Wine & Spirits Competition, where three double gold designations, a gold medal and a best in show were earned. The excellent and often overlooked Eagle Rare Single Barrel Kentucky Straight Bourbon Whiskey received double gold and was named Best in Show Spirit Sweepstakes Winner for “Best Bourbon, Best Whiskey & Best Brown Goods.” Also receiving double gold awards were Buffalo Trace Kentucky Straight Bourbon Whiskey and Blanton’s Single Barrel Kentucky Straight Bourbon. Sazerac Straight Kentucky Rye Whiskey received Gold. 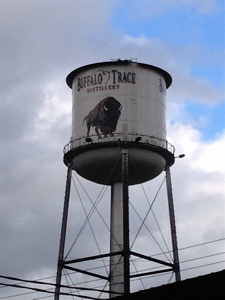 Congratulations to Harlen Wheatley, master distiller, and to all the folks at Buffalo Trace. It’s great to see this Frankfort institution thrive in what has become a golden age for the Kentucky bourbon industry. This entry was posted in Liquor, News, Travel and tagged Blanton's, Buffalo Trace, Buffalo Trace Distillery, Eagle Rare, Sazerac. Bookmark the permalink.